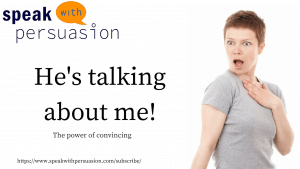 The power of convincing: "He is talking about me!" Persuading or convincing people isn’t easy. This means there is a really important thing you need to remember when you are on stage. Especially when you want to convince or persuade people. If you want to convince them about something that is your vision, you will need to make sure that you start off on the same side as those people. There is one thing that people really want when you describe a problem or when you describe a situation. That is that they feel like you’re talking about them. As soon as people have the feeling that you are talking about them, about their situation, they will give you 100% attention. And that is when they will feel that you understand them! And when they feel you understand them, they will feel that whatever you have to say will help them. And therefore they will believe you! As long as you can get that recognition element from your audience, you can convince them about anything you want. Do you have education budget for 2018? Here’s how to use it in 2019!